➡ Updated 11/23/09: The new DroboElite is now available. It differs from the DroboPro because it offers two Gigabit Ethernet ports instead of one, multi-host support, and up to 255 Smart Volumes. Today, April 7, 2009, Data Robotics launches a new product aimed at professionals and SMBs: the DroboPro. I got a preview of it yesterday. Let me share what I learned with you. The DroboPro has some really cool features, some of which I, along with others, anticipated and looked forward to seeing. As I wrote in my review of the Firewire Drobo, Data Robotics was looking at making an 8-drive Drobo, possibly rack-mounted. I also thought they might introduce the capability to safeguard against two drive failures. And, as I wrote in this comment on that same review, in response to a reader’s wishlist for the Drobo, I thought they might at some point build networking capabilities right inside the Drobo. Well, the new DroboPro does all those things and more! Let’s dive into those new features a bit. Keep in mind my knowledge is as yet limited, since I haven’t seen the full specs; I only had a phone briefing. You know how the drives are arranged horizontally in the regular Drobo? They’re arranged vertically in the new DroboPro, which is about the same height, and a little less than twice the width of the original. The DroboPro comes in a desktop form factor which is 12.17″ wide, 5.46″ high and 14.1″ long. The length is about 3″ more than that of the original Drobo. I think the extra space houses the additional circuitry for the network, power supply and other features. The other form factor is a rackmount with a 3U height. If I understood correctly, the rackmount kit can be attached and detached as needed, so you can interconvert between the two form factors if you like. One thing that’s easy to miss if you look at the back of the DroboPro is that it no longer has a DC adaptor port, but a regular 120-240V connector. Have a look and see. This means the power brick which converts 120-240V AC to 12V DC has been eliminated. You’ll also notice a power switch on the back. That’s new too. As it was explained to me, the DroboPro comes standard with single drive redundancy, and the dual drive redundancy is an option that can be turned on at any time. In case you’re not familiar with the concept, this means two of the drives inside the Drobo can fail, and your data will still be safe. Business-class networking is now built right into the DroboPro, along with enterprise-class features, like iSCSI with automatic configuration. The ethernet port on the DroboPro does not replicate the functionality of the DroboShare, as I initially thought. It only works through the iSCSI protocol, which means it needs to be mapped directly to a host, like a server or workstation, which can then share it among multiple servers or workstations. In that sense the DroboPro is not a NAS (Network Attached Storage), but a SAN (Storage Area Network). If you’ve set up iSCSI volumes in the past, then you know how much of a headache they can be, and how bad the performance can be if it’s not set up correctly or if the hardware isn’t working as it should. I know firsthand about this. With the new DroboPro, the iSCSI setup is automatic. It’s as easy as plugging it into the network. The Drobo Dashboard software then finds it and mounts it as a volume on your machine via iSCSI. The work is done behind the scenes so you don’t have to worry. For Windows, the DroboPro uses the Microsoft iSCSI initiator, and for the Mac, the folks at Data Robotics wrote their own iSCSI initiator. Those of you who work with Xserve and Xsan use Fibre Channel technology to connect to the network volumes, and you may wonder why Data Robotics went with iSCSI. It’s because iSCSI is more utilitarian. It doesn’t require special network hardware to work; it can use the existing ethernet network infrastructure, so there’s a lower cost of entry and maintenance. I was assured that iSCSI throughput on the DroboPro is very fast. I guess it’s up to us to do some testing once the DroboPro starts to ship, so we can see just how fast it is. See the iSCSI guide on Drobo’s website for more details. With the DroboPro, you can create up to 16 different virtual volumes, each of which can grow to 16TB. This is very important for the enterprise market, where companies want to be able to separate the data onto separate volumes and assign separate access privileges to each. Those of you who are network admins can readily appreciate how useful this is. Those of you who are creatives can also appreciate being able to assign a volume for Time Machine backups, one for videos, one for photos, and so on. Furthermore, each volume can be resized as needed, which is a huge leap forward compared to the difficulty of resizing LUNs set up over RAID volumes. The entry level DroboPro (enclosure-only) costs $1,299. 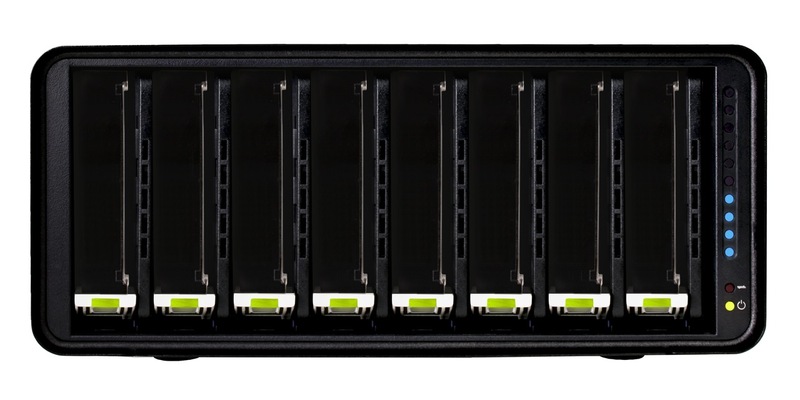 The high end DroboPro, which includes the rackmount kit, two drive redundancy and is pre-loaded with eight 2TB hard drives for a total of 16TB of space, costs $3,999. There’s also a handy customer loyalty program which will give you an instant $200 rebate if you’ve purchased a Drobo in the past. Those of you who might balk at the price should compare the features and ease of use of the DroboPro with other comparable products on the market. I’m going to walk you through a different kind of comparison, one that looks at the cost of the original Drobo and the cost of the new DroboPro. Think of the DroboPro as two regular Drobos in one. The original Drobo is $499 for the enclosure, so that brings the price to $998. The difference between $998 and $1,299 is made up by the additional networking features and the complexity of the circuitry and auto-management algorithms of an 8-drive array. Keep in mind the DroboPro has enterprise-class features like dual drive redundancy, iSCSI and smart virtual volumes. Those features alone warrant charging several hundred dollars to thousands more for it, as other companies who make similar products have already been doing. The DroboPro is a fantastic addition to the Drobo line. Its enterprise-class features, its incredible ease of use, and its unmatched storage flexibility make it the perfect external storage solution for busy professionals with serious storage needs or business server rooms. Users will appreciate all of the space it makes available for their work, and system admins will appreciate how easy it is to set up and maintain. From a design point of view, it’s a drool-worthy beauty. Having been a Drobo user for almost 1½ years, I can tell you it is my storage solution of choice, and I look forward to upgrading to a DroboPro some day. Probably one of the best ways to use this SAN would be to have a reasonably high end desktop or a server type machine connected to the iSCSI, running a hypervisor – ESX, XenServer, Hyper-V etc. On the hypervisor you can then run multiple virtual machines; Windows Server, XP, Windows 7, OSX Server (takes a bit of working out but can be done, though breaks Apple license agrement) etc. From my Macbook I can RDP to my VM’s, Windows Server 2008 and Windows 7. From my Windows 2008 server I have AFP and SMB file shares setup for my Time Machine and standard storage/file access for photos, music, movies and so on. It works flawlessly. One thing I would say – having just 1 iSCSI port seems strange for such a good device – you’re buying an arguably quite expensive redundant array of disks for high availability and resiliency, only to have a single point of failure in the iSCSI port – pretty poor from Data Robotics if you ask me. QNAP, Thecus and a number of other manufacturers have dual iSCSI ports included in their mid and high end range of products. You can also use standard ethernet and file sharing protocols over those ports – i.e. they double up as both SAN and NAS – arguably FAR better than the Drobo. Last but not least, the Thecus N7700 Pro, for example, comes with a Dual Core CPU and 4BG of RAM and currently offers the highest performance available for these arguably high-end SMB/home products. The N7700 Pro is also slightly cheaper than the Drobo Pro, if you hunt around. If like me though, you want the dynamic storage upgrade feature – the Drobo is the one. Getting a Thecus or QNAP would be nice, but if I ever want to upgrade my storage or change my RAID configuration from say RAID 5 to RAID 6 – no problem – once you’ve copied ALL of your data off and back on (after the RAID config change). Not good! I should add – the QNAP’s have some great features, it is highly recommended that people perform extended research before committing to buy any of these devices as they offer some unique features. I am a virtualisation consultant by trade so I have the added advantage of trade knowledge from the likes of VMware and Citrix and know exactly what I need. All up I think the Drobo BeyondRAID technology is very good. I look forward to their competitors offering this sort of technology along with the dual port iSCSI and dual core cpu, etc etc. Then we have the ultimate NAS/SAN device. I think so. I haven’t done it myself (I don’t have a DroboShare), but I think it’s doable. There’s even an app endorsed by Data Robotics which gives you remote access to your files. It’s called Yoics. If you want to get a DroboShare, make sure you get a regular Drobo, not the DroboPro. As you can see from the previous comments on this post, the DroboPro is not compatible with a DroboShare. And a Drobo + DroboShare can do this? Corel, that’s not going to work. The DroboPro’s ethernet port will only work with the iSCSI protocol to map it to a host on the local network. If you were a networking wiz, you might be able to get a VPN tunnel going between two remote sites, and somehow map your host to a remote DroboPro, but that would significantly decrease your throughput. It’d be pointless unless the tunnel would be really fat (have a lot of bandwidth, as much as a local network). So my answer is no. btw each main picture above can be clicked on to see full size version. (just in case you missed it). Sorry about that, Paul. I didn’t even check, because it seemed perfectly logical to me that it would work. That’s somewhat disappointing. I don’t understand why the DroboShare functionality would be affected. Q: Can I connect DroboPro to a DroboShare for sharing over a network? A: No. DroboPro is not compatible with DroboShare. 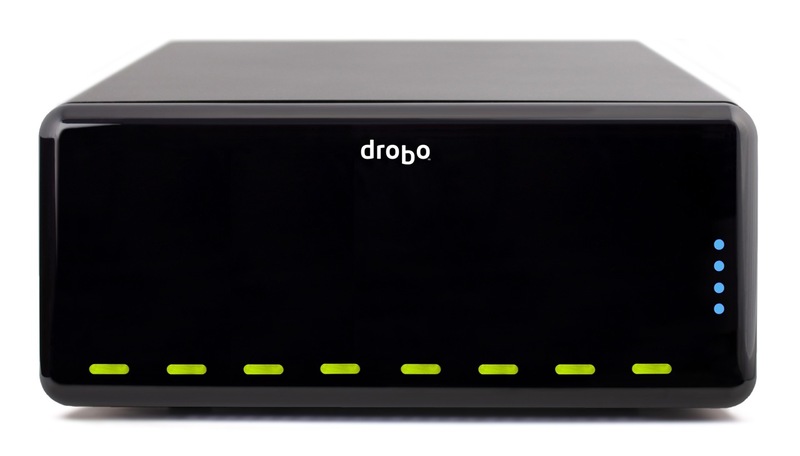 If you would like to share a DroboPro over a network, simply connect it to a server or workstation that has file sharing enabled. Ok, then the DroboPro can be connected to a DroboShare to use it with all the DroboAPPS? That would be a yes, ML. The USB functionality hasn’t changed, nor has the way the Drobo interacts with the DroboShare. I got a reply from Data Robotics that clarifies my concerns, and have modified my article accordingly. Indeed, as Paul and Taco have already pointed out, the ethernet port is only to be used for iSCSI connections. However, the DroboPro can be shared out to as many computers as needed via a host computer. In other words, it’s not a NAS but a SAN device. Q: Can I connect DroboPro directly to an Ethernet switch? A: You can plug DroboPro into a switch provided that the network is not using a DHCP server. For networks with a DHCP server, simply assign a static IP address to the DroboPro. This can be done from Drobo Dashboard: Advanced Controls > Tools > DroboPro Settings > iSCSI. Paul, I’m not sure. That’s how I understood it during the phone briefing. To be safe, I’ve posed the question directly to Data Robotics and am waiting to see what they say. Once they reply, I’ll post an update here and correct the post accordingly. I’ve read up on the Drobo Pro and I don’t think you can actually use the ethernet port like DroboShare. It appears as if it’s only for iSCSI and will only work when attached to one computer at a time. If you want to share the Drobo Pro, you’ll have to configure sharing on the attached computer. Looks very cool. Donations accepted.